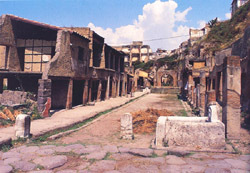 Herculaneum’s forum was an open wide square housing the basilica, the town’s administrative centre. Flanking this building was the College of the Priests of Augustus, its colourful frescos still surviving. This cult was not unique to Herculaneum. It was a found throughout the Roman world. It was founded to give freedmen, whose status barred them from traditional civic roles a role in civic life. One notable feature of forum was the marble plates that edged the walls of the square. They were inscribed with the names of all the male citizens. Whenever a citizen died, his name was removed, giving us an accurate record of the men of the city at the time of the eruption. It has been estimated that in 79AD, there were about 2000 male citizens.